Cimarex Energy Co is down 30% this year even though crude prices have been on the upswing, making it an intriguing value stock in the oil patch. While the price of crude oil has cooled off a bit over the past two months, it has still been red-hot this year, up roughly 15% to more than $70 a barrel. That rally has provided the fuel for most oil stocks to notch big gains this year, with the average oil and gas exploration and production (E&P) company rising about 15% as measured by the S&P Oil & Gas E&P Index. However, not all oil stocks have participated in this rally. One of the laggards is Cimarex Energy (NYSE:XEC), which continues to be one of the worst-performing oil stocks in the S&P 500, after having now lost more than 30% of its value this year. That sell-off doesn't make much sense, which is why value-seeking investors might want to take a closer look at Cimarex. Cimarex Energy is a mid-tier oil and gas company focused on the Delaware Basin and STACK Shale Play of Oklahoma, which are two of the fastest-growing oil production regions in the country. Cimarex currently anticipates that by focusing on drilling in these two regions, it can deliver 20% to 25% year-over-year growth in its oil production this year (and a 14% to 18% overall increase in total output), and that's even after accounting for the recent sale of some non-core assets to boost its already-strong balance sheet. That sale will add $570 million in cash to a balance sheet that held $411 million in cash at the end of the second quarter, giving the company a low 1.1 times net debt to EBITDA ratio, which is well under the sub-2.5 times comfort zone of most oil companies. Cimarex Energy's solid resource base and balance sheet position the company to grow total production at a 10% compound annual growth rate (CAGR) over the next three years, with oil output expanding at an even faster 13% CAGR over that timeframe. Further, the company can finance that growth while living within the cash flows it can generate at oil prices below $55 a barrel. In fact, at that price point, Cimarex can produce $500 million to $600 million in free cash flow in the next few years, with even more excess cash at current oil prices. That's a very comparable forecast to its peer group, where most project double-digit production growth while generating free cash at oil prices in the $50s. 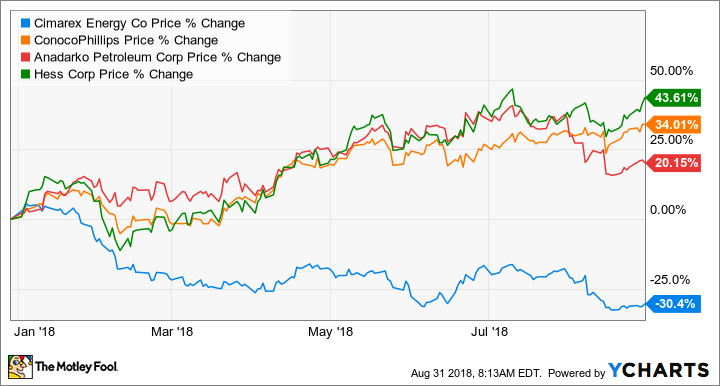 While Cimarex Energy compares favorably to peers in many categories, there is one key difference between the company and its top-performing rivals, and that is how they've chosen to allocate their excess cash. Instead of letting it pile up on the balance sheet like Cimarex Energy, competitors such as ConocoPhillips (NYSE:COP), Anadarko Petroleum (NYSE:APC), and Hess (NYSE:HES) are returning that money to investors, mainly through needle-moving stock buyback programs. ConocoPhillips bought back $3 billion in shares last year and planned to spend that much on repurchases in 2018. Overall, ConocoPhillips expects to spend $15 billion in buying back its stock over the next few years, which could retire 20% of its outstanding shares. Anadarko, meanwhile, announced a $2.5 billion buyback last fall, which was enough money to reduce its share count by 10%. Anadarko has gone on to boost that authorization to $4 billion and has already spent $3 billion of that amount. Finally, Hess stared with a $500 million buyback last fall but has since added $1 billion to its program. These buybacks are worth noting since they've helped supercharge the returns of these oil stocks this year. Given the outperformance of oil stocks that are returning cash to shareholders, a similar program by Cimarex could be just the fuel it needs to boost its stock price. That's why investors should take notice of the company's recent decision to increase its dividend by 12.5%. In making that announcement, CEO Tom Jordan stated that it returned "Cimarex to a pattern of growing our annual cash return to shareholders." While that doesn't necessarily mean the company is planning to follow it up with a share buyback program, it does at least hint at the possibility. A buyback would certainly make sense given that Cimarex now sells for just six times cash flow, which is a below-average valuation compared to most U.S. oil stocks. With shares of Cimarex selling off this year, it's becoming a tempting value stock. Adding to the appeal is the fact that the company has a cash-rich balance sheet and appears poised to generate a growing supply of free cash in the coming years that it could begin using to buy back its beaten-down stock. That potential catalyst makes it a compelling oil stock to watch since it could have significant upside if it starts putting its cash to work in unlocking the value of the company.